Addison Wesley. Hardcover. 0321305043 New Condition *** Right Off the Shelf | Ships within 2 Business Days ~~~ Customer Service Is Our Top Priority! - Thank you for LOOKING :-) . New. 2018-03-22. New. Ships with Tracking Number! INTERNATIONAL WORLDWIDE Shipping available. Buy with confidence, excellent customer service! 2018-03-22. Good. Ships with Tracking Number! INTERNATIONAL WORLDWIDE Shipping available. May not contain Access Codes or Supplements. May be ex-library. Shipping & Handling by region. Buy with confidence, excellent customer service! 1992-02-08. New. Ships with Tracking Number! INTERNATIONAL WORLDWIDE Shipping available. Buy with confidence, excellent customer service! 1992-02-08. Good. Ships with Tracking Number! INTERNATIONAL WORLDWIDE Shipping available. May not contain Access Codes or Supplements. May be ex-library. Shipping & Handling by region. Buy with confidence, excellent customer service! 1988-03-04. Good. Ships with Tracking Number! INTERNATIONAL WORLDWIDE Shipping available. May not contain Access Codes or Supplements. May be ex-library. Shipping & Handling by region. Buy with confidence, excellent customer service! Addison Wesley. Hardcover. 0321305043 New Condition. . New. Harpercollins College Div. Hardcover. 0673463281 New Condition. . New. Harpercollins College Div, 1992-01-01. 3rd. Hardcover. Used:Good. Longman Higher Education, 1988-03-31. 2nd. Hardcover. Used:Good. Addison Wesley. Hardcover. 0321305043 Like New Condition. . Fine. Harpercollins College Div. Hardcover. 0673463281 Like New Condition. . Fine. Pearson Academic. Used - Good. Former Library book. Shows some signs of wear, and may have some markings on the inside. Addison-Wesley, 2000. Book. Near-Fine. Hardcover. 8vo - over 7¾" - 9¾" tall. A photo of this book is available. Stated FIFTH EDITION. NO writing, marks or tears inside book. Tight spine, bright pages. 630 pages. 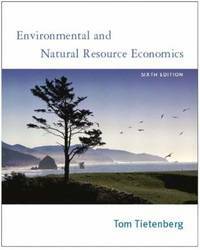 Product Description: Introduces environmental and natural resource policy problems of today through the integrated discussion of economic theory and empirical evidence. Designed for students with in introductory economics or intermediate microeconomics course. DLC: Environmental economics..
Addison Wesley, 2005-08-13. Hardcover. Good. Pearson, 2003. This is an ex-library book and may have the usual library/used-book markings inside.This book has soft covers. In fair condition, suitable as a study copy. Pearson, 2003. This book has soft covers. Ex-library, With usual stamps and markings, In fair condition, suitable as a study copy. Published by HarperCollins 77-85 Fulham Palace Road, London Third Edition 1992. London 1992., 1992. Hard back binding in publisher's original colour illustrated laminated boards. 8vo 9½'' x 6¼'' 678 pages. ISBN 0673463281. In Fine condition, unused new book, no dust wrapper. Member of the P.B.F.A. Pearson, 2009. Paperback. Very Good. Disclaimer:A copy that has been read, but remains in excellent condition. Pages are intact and are not marred by notes or highlighting, but may contain a neat previous owner name. The spine remains undamaged. At ThriftBooks, our motto is: Read More, Spend Less.Dust jacket quality is not guaranteed. Pearson, 2009. Paperback. As New. Disclaimer:An apparently unread copy in perfect condition. Dust cover is intact; pages are clean and are not marred by notes or folds of any kind. At ThriftBooks, our motto is: Read More, Spend Less.Dust jacket quality is not guaranteed. Harpercollins College Div, 1992-01. Hardcover. Good. Addison Wesley, 2005-08-13. Hardcover. Good. Excellent customer service. Prompt Customer Service. Glenview, Illinois: Scott, Foresman and Co., 1988. 559pp. Good clean copy.. Second Edition. Printed Boards. Very Good. 240x165mm. Longman Higher Education, 1988-03-31. Hardcover. Good. Addison Wesley. Used - Acceptable. Former Library book. Shows definite wear, and perhaps considerable marking on inside. Addison Wesley. Used - Good. Ships from Reno, NV. Shows some signs of wear, and may have some markings on the inside. 100% Money Back Guarantee. Shipped to over one million happy customers. Your purchase benefits world literacy! Addison Wesley. Used - Good. Former Library book. Shows some signs of wear, and may have some markings on the inside. Harpercollins College Div. Used - Good. Good condition. Owner's name on inside cover. Addison Wesley School, 1988. Hardcover. Good. Disclaimer:A copy that has been read, but remains in clean condition. All pages are intact, and the cover is intact. The spine may show signs of wear. Pages can include limited notes and highlighting, and the copy can include previous owner inscriptions. At ThriftBooks, our motto is: Read More, Spend Less.Dust jacket quality is not guaranteed. Longman, 02/01/1996. 4th Revised edition. Hardcover. Used; Good. **WE SHIP WITHIN 24 HRS FROM LONDON, UK, 98% OF OUR ORDERS ARE RECEIVED WITHIN 7-10 DAYS. We believe you will be completely satisfied with our quick and reliable service. All orders are dispatched as swiftly as possible! Buy with confidence! Addison Wesley. Hardcover. 0321305043 Student Edition. No apparent missing pages. Heavy wrinkling from liquid damage. Heavy wear, fading, creasing, Curling or tears on the cover and spine. May have used stickers or residue. Good binding with NO apparent loose or torn pages. Heavy writing, highlighting and marker. Supplemental materials are not guaranteed with used books. . Fair. 2005. Addison Wesley, 2005. Hardcover. Acceptable. Disclaimer:A readable copy. All pages are intact, and the cover is intact. Pages can include considerable notes-in pen or highlighter-but the notes cannot obscure the text. At ThriftBooks, our motto is: Read More, Spend Less.Dust jacket quality is not guaranteed. Addison-Wesley Longman, Incorporated, 1999. Hardcover. Good. Disclaimer:A copy that has been read, but remains in clean condition. All pages are intact, and the cover is intact. The spine may show signs of wear. Pages can include limited notes and highlighting, and the copy can include previous owner inscriptions. At ThriftBooks, our motto is: Read More, Spend Less.Dust jacket quality is not guaranteed. Addison-Wesley Longman, Incorporated, 2002. Hardcover. Good. Disclaimer:A copy that has been read, but remains in clean condition. All pages are intact, and the cover is intact. The spine may show signs of wear. Pages can include limited notes and highlighting, and the copy can include previous owner inscriptions. At ThriftBooks, our motto is: Read More, Spend Less.Dust jacket quality is not guaranteed.